Learn how to make mochi, Japanese rice cakes made with glutinous rice. 2.5 hour course will teach you how to make mochi the easy way, At the end of the course you will be able to taste the Mochi with a bowl of Matcha, green tea. This class can be combined with a wagashi making class upon request. In which case, you will be making 2 nerikiri wagashi, 2 strawberry daifuku and three color dango (mochi on skewers). (Other fruit will be used in case strawberries are unavailable). The class takes place in a private home located within walking distance from Meguro or Gotanda Station of the JR Yamanote Line or the metro station. 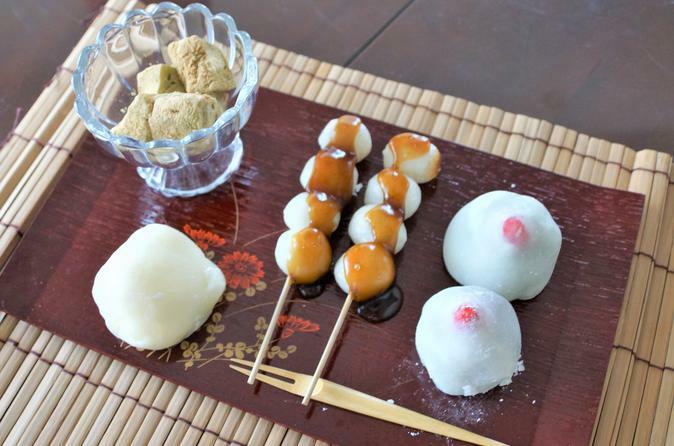 You will be greeted by the instructor who will start off by making nama-yatsuhashi, a cinnamon/matcha flavored mochi with red bean paste filling, Then you will learn to make the strawberry daifuku mochi, mochi ice cream and mitarashi dango (Sweet soy sauce glazed mochi on skewers). If you choose the wagashi combination class, you will make 2 nerikiri wagashi instead of the mochi ice cream and mitarashi dango. Most materials are plant-derived and no meat, seafood or eggs will be used. Dairy product will be used for the mochi ice cream. A vegan option is available where the ice cream will be substituted by non dairy ice cream. The instructor who is a certified Nerikiri Art Instructor is very fluent in English so she will be able to give you some insights on the local life as well as advice on where to shop or go sightseeing in Tokyo. Aprons will be provided and an English Recipe Sheet will be given to take home.